You can enroll if you are age 14 or above. What is the language of conduction? Applicants should submit “FM001a_Course Application Form“ and Payment reference to Cello Factory before course commencement. Please read the FM001TC_Course Terms and Regulations before application submission. What does the application fee include? The fee covers 8-lesson tuition only. Instrument Rental Scheme and teaching materials are not included. For more information, please contact us by phone 2728 7906 or email info@cellofactory.com. How to join the Hong Kong Cellist Society for member discount? 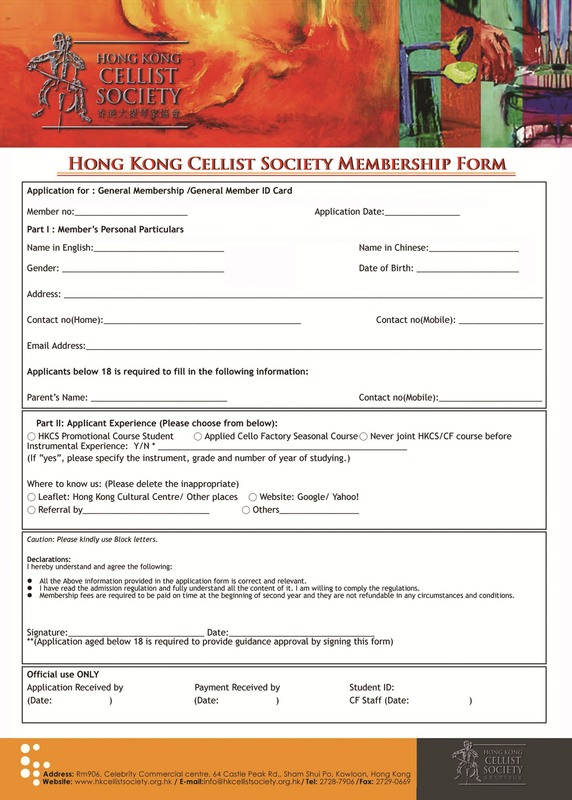 Please download and complete the Hong Kong Cellist Society Membership Form with your course application documents and send them back to Cello Factory by email info@cellofactory.com. You will receive the membership confirmation via your provided email within 7 working days. Do I need to buy a cello for the course? Students should prepare their instruments for their lessons. For students who do not own any instrument, Home and Lesson Instrument Rental Schemes are available. For more information, please contact us by phone 2728 7906 or email info@cellofactory.com. For students with their own instruments, Cello Factory recommends them to bring their instruments for check-up before course commencement in order to ensure their instruments properly set up for learning and practicing. You can enroll if you are age 4 to 13. Seasonal Course offers well-rounded musicianship training in playing and listening and performance opportunities to students who wish to develop their skills beyond fulfilling examination requirement. The Course will facilitate students to develop the necessary skills and knowledge for playing a wide repertoire of music at the end of each level and to nurture a true understanding and appreciation for their choice of instruments through developing and mastering playing techniques and ensemble techniques (from Elementary IV onward), and gaining performance experiences. Developing playing techniques is one of the core teaching elements in Seasonal Courses of all levels. The lessons are structured in a progressive manner and provides different trainings to facilitate students in developing knowledge and understanding in music and their instruments..
Ensemble skills are essential for developing a well-rounded musicianship and it can be introduced once students have mastered some basic playing techniques. From Elementary IV and onward, the lessons will also include ensemble techniques to allow students to transform from soloists to team players by strengthening music coordination amongst players and building team spirit. Gaining experience in performance is beneficial to students in developing playing manner and confidence. Seasonal Concert Practices and Public concerts are arranged for students from all levels. Seasonal Concert Practices held at the end of each term will simulate the arrangement of a concert and allow students to perform in front of peers and receive feedback from musicians and instructors. In annual Public concert, students will have the opportunity to showcase their accomplishments and results for that year’s hard work. Pass ABRSM Grade 1 in Cello. Within the two-year validity period of the test result are accepted. Pass ABRSM Grade 2/3 in Cello. Within the two-year validity period of the test result are accepted. Pass ABRSM Grade 4/5 in Cello. Within the two-year validity period of the test result are accepted. Pass ABRSM Grade 6/7/8 in Cello. Within the two-year validity period of the test result are accepted. Pass ABRSM ARSM level in Cello. Applicants who are new to Cello Factory and wish to enroll in the Seasonal Course will need to attend a compulsory Evaluation Lesson for skill level and progress evaluation and enrollment recommendation. After the Evaluation Lesson, they can enroll current courses or upcoming courses. Evaluation lesson lasts about 30 minutes with a non-refundable fee of HKD $480. For details, please see here. The fee covers 14-lesson tuition only. Instrument Rental Scheme and teaching materials are not included. For more information, please contact us by phone 2728 7906 or email info@cellofactory.com.